“Chica, quieres comprar2?” The woman sitting next to me on the bench held out a three-peso coin with Che Guevara’s face on it as she asked that question. I smiled and shook my head no. I already had all the souvenir pesos nacionales that I needed from the semester I studied in Cuba as an undergraduate. The three-peso coin was worth about U.S. fifteen cents, but she would sell it for at least one dollar. It was my first day at La Feria, an artisan market in Old Havana, the site of my Master’s Thesis field research. I was just getting the lay of the land for how I would conduct my research. I was interested in studying how tourists’ experiences in Cuba were embodied in their souvenir purchases. On that first day and during that initial interaction with the woman on the bench, I did not know that the recurring motif of my research would be the Cuban economy and how tourists interacted and experienced it rather than the souvenirs they were buying. Cuba adopted its Marxist-Leninist economic system in the midst of the Cold War when communism was both demonized and romanticized by those not living in such a system. With the fall of the Soviet Union and the disappearance of the communist threat, it is now far easier to romanticize communism. These romantic notions undoubtedly inspire some tourists in their decision to travel to Cuba. In fact, a number of tourists I interviewed in August 2009 commented that they had wanted to see Cuba before it changed.3 One can only assume that this anticipated change refers to the loosening of trade and travel restrictions and subsequent influx of capitalist ideals. Yet, what my research indicates is that the tourism industry in Cuba is already strongly influenced by the capitalist tendencies of competition, commodification, and capital accumulation, thus, creating a situation where tourists’ experiences of the Cuban economy fall outside of the romanticized notions of communism. In some cases this severely challenged tourists’ expectations for what they would find in Cuba. This is significant as we consider the implications on the Cuban (tourist) economy caused by changes made to the Cuban economic and political system. This paper is based on data collected during ethnographic fieldwork conducted in the summer of 2009 as well as observations accrued during my semester as a student at the University of Havana in 2004. My primary data collection site, La Feria, is an artisan market located in the Old Havana district of Havana. It is a full block located between streets Tacón and Mercaderes. Tourist trips to the colonial plazas generally include a stop at the large artisan market. It sits to the east and south of a park that faces the Malecón and is comprised of stands covered by umbrellas that are put up and taken down daily. The Feria is open from Tuesday to Saturday. There are a number of additional shops and restaurants behind the market primarily for tourist patronage because the prices are in convertible pesos rather than Cuban pesos.4 Most of the shoppers are foreigners. Around the outside of the Feria and the park, there are a number of horse carriages run by the Office of the City Historian, which offer tours of Old Havana. There are also a number of taxis prepared to give lifts to shoppers. Tour buses stop alongside the park to drop off and pick up their passengers. Within and around the Feria a number of Cubans sell things or services. During the month I was there I was offered Cuban cigars, rooms for rent, train tickets, marijuana, hair braids, peanuts, Cuban pesos, Cuban newspapers, pirated CDs, and boyfriends. My primary research subjects were tourists, and when I approached people around the market, I started out by asking whether or not they were foreigners and if they minded answering my questions. Then I asked how long they would be in Cuba, why they went there, where in Cuba they were visiting, and what they bought at the Feria and why. I often inquired if they were staying in hotels or private homes and what their expectations were before they got to Cuba and how Cuba has satisfied those expectations. I also asked what has been the most impacting experience of their stay in Cuba. Speaking to tourists about their souvenirs was often just the pretext for starting a larger discussion about their experiences and perceptions of Cuba. It is through these conversations that tourists revealed their experiences with the Cuban economy. Admittedly, the data collection process was not flawless, as the interviews were often rushed. Moreover, my very presence as a researcher at the Feria brought about an abnormality that, while unavoidable in the research site, I must always account for in my interpretation. Given a second opportunity, I would make changes in both my line of questioning and my privileging of breadth over depth. Nevertheless, the anonymity I guaranteed the tourists by not asking for any personal identifying information, as well as the insights that I, as a foreigner who had lived in Cuba, was able to provide them, allowed me to gain enough trust for them to answer my questions and talk about their experiences. Those experiences have provided me with the insights to perform the subsequent analysis and draw conclusions about tourism in Cuba. 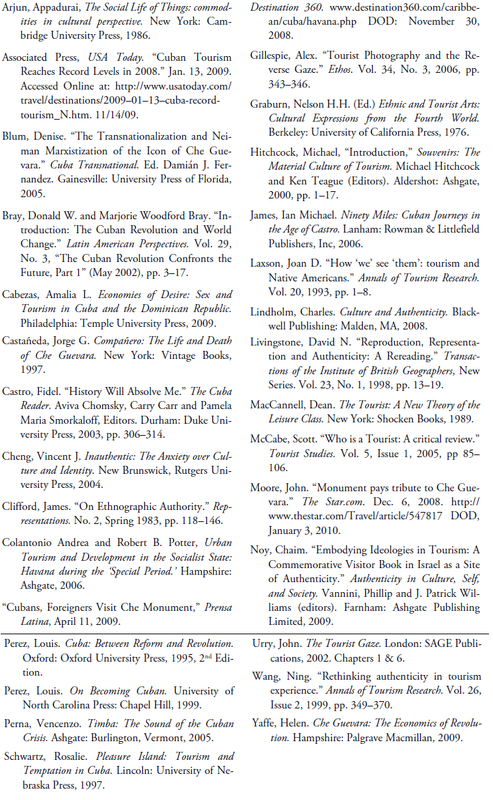 Before delving into those, I will provide background on the Cuban political economy as it relates to tourists. Cuba’s system of government is generally characterized as Marxist-Leninist; however, the system itself is very difficult to define as being entirely representative of any one political or economic school of thought. My research and interest in the Cuban economy has less to do with the actuality of it and much more to do with people’s perceptions of it. Thus, I find it important to point out the following, while not delving into too much detail. In 1953, following his first attempt to overthrow President Fulgencio Batista, Fidel Castro gave a speech in his defense at his trial. During his speech, he referenced the rampant poverty in Cuba, the vast inequality between the rich and the poor, Cuba’s reliance on a few products, its lack of industrialization, and its dependency on foreign investment and markets.5 He outlined a plan for reforms that a revolutionary government would undertake in order to address these issues.6 When he took power on January 1, 1959, it was with the intention of carrying out what he had put forth in 1953. Soon after the Revolution, Cuba allied with the socialist countries of Eastern Europe and Fidel Castro declared the Revolution to be socialist in 1961.7 This declaration is what has characterized Cuba as a place distinct from capitalism, thus setting tourists’ expectations accordingly. For the past fifty-one years, Cuba has continued to champion its Revolutionary project; yet the policies have evolved over time. Thus, while maintaining an ideology based on Fidel’s proclamation in 1953, the practices do not always align with those beliefs. The collapse of the Soviet Union, which led to the loss of about 80% of Cuba’s trade and 35% of its GDP,8 put particular strain on both the Revolution and its ideology. Suffering from shortages in everything from food to electricity, Cuba had to make a number of economic reforms during the Special Period.9 Legalizing the use of the U.S. dollar through the establishment of a dual currency system10 and developing the tourist sector11 were among the chief reforms. Both of these reforms work together to challenge Cuba’s socialist ideology and communist system. The dual currency system currently consists of two official currencies: Cuban Convertible Pesos (CUC) and Cuban Pesos Nacionales.12 Tourists arriving in Cuba can exchange their home-country currencies for CUC at Cadecas (official currency exchange houses) or banks. The CUC is valued at roughly $1.00 USD and is Cuba’s only hard currency. Cubans are paid in Cuban Pesos. Twenty-five Cuban pesos purchase one CUC. The dual currency system enables Cuba to trade on an international level with its hard currency while maintaining a local economy under which Cubans operate for their daily subsistence. The tourist industry is fueled by hard currency, and thus hotels, taxis, most restaurants, some stores, and souvenirs all charge in CUC. There are a number of places that charge in both currencies, and access to each price depends on whether or not the person is a Cuban or not. For example, museums and entertainment venues charge foreigners in CUC and Cubans in Cuban Pesos. Some stores and restaurants, local buses, the produce markets, and food counters charge in Cuban Pesos. Identifying which currency one needs to pay in a given place requires having some concept of the value of the items in Cuba as well as a general idea of the way the economy and system is set up. While the señora in whose house I was staying during my fieldwork told me that Cuban pesos are for Cubans, there appears to be no restriction on foreigners obtaining Cuban pesos at official change houses. I never had a problem exchanging CUC for Cuban pesos during any of my trips to Cuba. In fact, I was given an orientation on how to use both currencies during my first week studying in Cuba. CUC and Cuban Pesos can be exchanged at Cadecas and tourists are not prohibited from using Cuban Pesos. While they will be denied the Cuban price in museums and some restaurants, most places do not have separate prices for tourists and Cubans and it is merely a matter of which currency is handled in which place. Similarly, Cubans are able to obtain and use CUC. In fact, many food and hygiene items and all technological items are only available in CUC. Beyond facilitating disparities, tourism, which has been Cuba’s principal revenue-generating industry since the mid 1990s promotes consumption and competition. Again, both of these traits are disassociated with a communist economy and the Cuban Revolutionary project; and, both of them greatly impact the way tourists experience the Cuban economy. The dual currency system can be both unfamiliar and confusing to many tourists. Returning to that first day of research on the bench with the elderly Cuban lady, her benign attempt to sell Cuban pesos to me turned into a far more awkward situation when a tourist couple sat down on my other side. After excusing myself from her, I turned to them as potential research participants and started asking them my questions. Since they were on a year-long trip around the world, we had some interesting things to talk about, and the conversation was going on for a while when the woman got my attention and told me to ask them if they wanted to buy her pesos. I did not want my research to interfere with the normal interactions between Cubans and foreigners, but nor did I want to participate in what could be perceived as a deceptive exchange.15 I turned to the couple and told them what the woman wanted but with a slightly discouraging tone. They either picked up on my tone or were already prepared to say no because they responded that they would just stick with the currency they were familiar with. Before the Cuban woman got up and walked away, she asked if I would buy one of her Granma newspapers from July 27 with Raúl Castro’s anniversary of the Moncada Barracks attack speech.16 I gave her the equivalent of twentyfive U.S. cents for what is sold for one U.S. cent. It was a token gesture because I had been unwilling to take her up on her offers, but I also felt somewhat responsible for her not making her sale. Once she left I turned to the couple again and we discussed the situation of money in Cuba. They were unfamiliar with Cuba’s dual currency system and I explained the Cuban value of what she was offering. I also told them that the money depicts historical Cuban figures like Che Guevara, not unlike a number of souvenir items sold in the Feria. Those items with images of Che generally carried a price of at least one CUC. Thus, from a tourist’s perspective, the money could be seen as a souvenir. Although the value of the money she was selling was technically only a few cents, the value as a souvenir to a foreigner unfamiliar with the Cuban peso system is much higher. This entire situation reveals some points of interests about the relationship between tourists and the Cuban economy. The first is that the system is hardly transparent to tourists. Many of them are unaware of the fact that these two currencies exist in Cuba sideby- side. Second, tourists’ lack of knowledge opens the door to Cubans to profit when they sell coins for approximately eight times their economic value when tourists technically could obtain them at face value. While I do not condemn Cubans’ attempts to make profit, the profit-driven behavior maps more easily onto folk perception of a capitalist system than a communist one. Moreover, Cubans’ profiting on tourists’ naiveté has a tendency to frustrate tourists, affecting how they experience Cuba. One Canadian couple that I interviewed had no idea about the different currencies when I spoke to them. After I explained how they work, the woman expressed her annoyance saying that now she knows why she feels like she had been ripped off on some occasions.17 Her charged words of getting “ripped off” express her frustration and dissatisfaction with the way she was treated. Rather than feeling as though she were an equal, worthy of knowing about the different currencies, this woman remained on the outside. The fact that her outsider status led to financial gain for whichever Cubans she was interacting with during her exchanges, demonstrates a priority on capital accumulation and the capitalist tendencies of the tourist economy in Cuba. To further illustrate the privileging of capital accumulation over bringing tourists in to the socialist agenda of the Cuban system, I share a story of something I observed in Havana’s Chinatown.18 In Chinatown there is a little alley with approximately ten restaurants. Right before entering this no-outlet alley of restaurants, there is a food counter that sells items in Cuban pesos including Cuban milkshakes called batidos. The standard price of a batido in Cuba is generally three to five Cuban pesos (between 15–25 U.S. cents), for approximately six ounces of beverage. Like most food counters in Cuba, people order their food or drink and stand at the counter consuming it, as there were no disposable dishes. It is plausible that these tourists were aware of the dual economy and just happy to make the purchase in the currency appropriate to their position in Cuba; however, they were overpaying by such a substantial amount, it seems unlikely. If they knew about the actual price and difference in currencies, a more normal course of action would be to pay extra but not three CUC for three Cuban pesos. The price is not set at a 25 to 1 ratio; the intention is not for foreigners to pay twenty-five times more for everything. Rather, it is that some products have their values set in Cuban pesos and others have values set in Convertible pesos. Thus, it is unlikely that these particular foreigners were aware of what was going on. I was very intrigued by this interaction and particularly the employee’s reaction. It seemed second nature to her not to let the people in on the fact that they were overpaying for the batidos, yet her delight was apparent to someone who was looking for it. Did she have experience in these types of situations and that is why she reacted so naturally, or was it just a survival skill that was innate? To satisfy my curiosity, after eating at a restaurant in the alley I returned to the counter and asked the employee if getting paid in CUC rather than Cuban pesos is a common occurrence and her response was “if only—it almost never happens.” Thus, it seems that her response was automatic and innate. This anecdote further substantiates the way tourists experience the Cuban economy as outsiders, thus reiterating that tourists are not brought into the communist system. My observations reveal that not only are tourists not informed about the dual currency system when they are grossly overpaying, but sometimes the tourists are actively deceived so that profit can be gained. As mentioned above, feeling that they have been deceived affects tourists’ perceptions of Cuba. The Canadian couple mentioned above talked about how they felt that the Cuban people were less friendly than they expected. Feeling deceived and taken advantage of this, likely contributes to this perception of the Cuban people. In addition to feeling deceived, other tourists expressed frustration at the fact that they are pushed into a capitalist system rather than a communist one in Cuba. The following section on Che Guevara souvenirs will reveal the extent to which tourists are pushed to experience a very different system in Cuba and their responses to that. While visiting a mausoleum and museum in Santa Clara, I was surprised to discover that there would be no fee to pay my respects to and learn about the life of one of Cuba’s greatest icons: Che Guevara. After my silent passage through the dark chambers where his body and those of the other Cuban revolutionaries who fought alongside him in Bolivia are interred, I perused the museum looking at artifacts from Che’s life. I then returned to the stifling heat to collect the backpack I was not allowed to bring in with me. I mused at the fact that there was not one single Che souvenir being sold at this tourist attraction and when I left a tip for the woman at the bag check she stoically told me that there was no fee to enter the museum or for the bag check before finally accepting what I told her was a tip. Given Che’s belief that “society should be governed by something other than money,”19 the fact that his memorial site is completely devoid of commerce could be a way to show reverence to him. Yet, his ideology does not seem to deter Cuba from profiting from his image anywhere else. Souvenir items that bear Che Guevara’s image are abundant in Cuba. They were frequently listed among the souvenirs purchased by the tourists I interviewed. While the mausoleum commemorates Che and draws some tourists to it, Santa Clara is not a top tourist destination. In 2008, a total of 247,700 people, both Cubans and foreigners, visited the mausoleum20 while a reported 2.35 million tourists visited Cuba overall that year.21 Thus most tourists’ access to Che Guevara in Cuba is not through this commemorative, almost sacred tribute to Che, but rather through the revolutionary propaganda or the consumer-driven selling of his image in places such as the Feria. The sale and purchase of Che’s image on souvenirs is polemical in a communist system. “Che aligned himself with the socialist view that one should not be alienated from his or her labor or commodified as one is under capitalism,”22 however, Che souvenirs indicate the commodification of Che Guevara for profit. Of course Che’s image is sold the world over on everything from watches and vodka to personal journals and designer clothes,23 but there is something unique in the selling of Che’s image within Cuba, the place where Che made the most impact and where his ideology contributed to the establishment of a society that is not consumer-driven. That ideology attracts people to Cuba. When I asked why he chose to go to Cuba, a Spanish tourist said he was satisfying his “ideological dream.”24 Other tourists, when talking about their Che Guevara souvenir purchases, mention a connection to his ideology as a reason for making the purchase. Moreover, for tourists seeking to give meaning through travel to their work-a-day lives as so many tourists do25 there is little better way to deal with the alienation of a capitalist system than to experience its binary opposite (or at least what communism has been painted as due to the Cold War). For tourists making an ideological pilgrimage, they may be sorely disappointed that while the Cuban school children are encouraged to be like Che (and actually have to recite a slogan that includes that statement every morning),26 tourists are encouraged to consume Che. The situation presented by the Che souvenirs reflects how tourists are placed in a position to contradict the Cuban ideology by pushing them to be more consumer-oriented rather than less so. Some tourists discussed their disillusion with the contradictions in the system and the fact that they are pushed to experience the capitalist side of the economy. I spoke to a group of tourists from Spain, including a law professor, who was very exasperated by the fact that “Cuba uses capitalism at its whim and is exploiting tourists in the process.”27 He mentioned how prices on goods such as bottled water are more expensive in places more frequented by tourists. He said that he felt very deceived by the system; that rather than demonstrating that equality is possible, it relied on tourists to not only boost the legitimate economy, but to also fuel the underground one. My conversations with Cubans testified to this man’s point. I spoke to a carriage driver for the Office of the City Historian who told me that one of the perks of his job is that he gets several boxes of cigars each month that he can sell to tourists riding in his carriage. This suggests that not only are the authorities aware of the underground economy, but they are complicit in it. The law professor claimed the Cuban government knows that Cubans cannot survive on their minimal salaries and rations and thus supports an underground economy based on capitalist principles. This allows them to report statistics from the legitimate economy all the while saying that everyone is doing well. The validity of this claim is hard to substantiate, but it is true that tourists’ role in Cuba is more like that of a silent partner than a participant in the socialist project. In the process of economically supporting the Revolution, tourism ultimately requires tourists to unwittingly participate in contradicting the Cuban ideology and system. If experiencing the Cuban system (however romanticized the notion may have been) was one of their primary motivations for traveling to Cuba, then being placed in a position to contradict it, likely affects both their perception of Cuba and overall satisfaction with their trip. Those two things have an impact both on theirs and others’ future travels to Cuba. Looking at the ways in which tourists interact with the Cuban economy is especially important as we contemplate a Cuban transition. During a transition, it is likely that tourism will remain the primary source of revenue. The transition means that Cuba’s economic and government system may change. My research has illustrated that tourists are already experiencing a capitalist system in Cuba, and in many cases this is a source of frustration to them. While a transition may very well lead to a stronger capitalist system that is more welcomed by tourists, it is also important to keep in mind that Cuba’s unique system is a selling point for some tourists. Changes to the system may diminish tourists’ perception of it as a distinct destination and ultimately affecting their decisions to travel there. While this does not mean that a transition should not take place, it does remind us of the multitude of factors to take into consideration when anticipating and implementing a transition. Tourists’ perspectives, however romanticized, may be one of them. 1. Editor’s Note: This paper was submitted to the 2011 ASCE Student Prize Competition for graduate students. 3. Field Notes from July 31–August 25, 2009. At that time there was heightened speculation about what Barack Obama’s recent election would mean for U.S.-Cuba relations. 4. The difference will be discussed in the section on currency. 5. Castro, Fidel. “History Will Absolve Me.” Editor’s Note: Full citations are under Works Consulted, at the end of the paper. 9. Period immediately following the collapse of the Soviet Union. 11. Perez, Cuba: Between Reform and Revolution, p 390. 12. Up until 2004, the CUC and U.S. dollar were interchangeable. In 2004, the Cuban government prohibited the use of the U.S. dollar, using only the CUC instead. 13. Tuesday, August 4, 2009. 15. As mentioned, the monetary value of the coins was significantly less than the money she was trading them for. 16. On July 26, 1953, Fidel Castro led the first uprising against the Batista government. He was unsuccessful and later exiled to Mexico. The anniversary of this first attempt is commemorated each year since the Revolution’s success in 1959. 17. From interview on Friday, July 31, 2009. 18. Friday, August 21, 2009. 21. Associated Press, USA Today. 24. From Interview on Saturday, August 1, 2009. 27. From interview on Saturday, August 22, 2009. Erin Flynn McKenna is a doctoral student in the Department of Recreation, Sport and Tourism at the University of Illinois at Urbana-Champaign. She has conducted field research in Mexico City and in Cuba, and her research interests include cultural immersion tourism and representations and perceptions of travel destinations.